Lelais, G.; MacMillan, D. W. C. History and Perspective of Chiral Organic Catalysts. 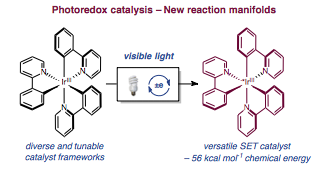 In New Frontiers in Asymmetric Catalysis; Mikami, K., Lautens, M., Eds. ; Wiley: Hoboken, New Jersey, 2007; pp 313–358. Lelais, G.; MacMillan, D. W. C. Iminium Catalysis. 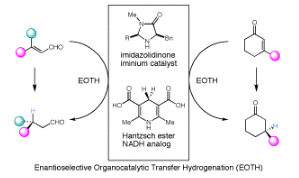 In Enantioselective Organocatalysis: Reactions and Experimental Procedures; Dalko, P. I., Ed. ; Wiley-VCH: Weinheim, 2007; pp 95–120. Watson, A. J. B.; MacMillan, D. W. C. Enantioselective Organocatalysis Involving Iminium, Enamine, SOMO, and Photoredox Activation. In Catalytic Asymmetric Synthesis, 3rd ed. ; Ojima, I., Ed. ; Wiley: Hoboken, New Jersey, 2010, Chapter 2A, pp 39–57. MacMillan, D. W. C.; Watson, A. J. B. Photoredox Organocatalysis Mediated Enantioselective α-Functionalization. In Science of Synthesis: Stereoselective Synthesis 3. Evans, P.A., Ed. ; Thieme: New York, New York, 2011, Chapter 16, pp 675-746. Prier, C. K.; MacMillan, D. W. C. Dual Photoredox Catalysis: The Merger of Photoredox Catalysis with Other Catalytic Activation Modes. In Visible Light Photocatalysis in Organic Chemistry; Stephenson, C. R. J., Yoon, T. P., MacMillan, D. W. C., Eds. ; Wiley: Hoboken, New Jersey, 2018, Chapter 10, pp 299-333.